Queen duvet cover (88" x 88") featuring the image "White Poppy Garden II" by Madeleine Holzberg. Our soft microfiber duvet covers are hand sewn and include a hidden zipper for easy washing and assembly. Your selected image is printed on the top surface with a soft white surface underneath. All duvet covers are machine washable with cold water and a mild detergent. Appreciate your lovely compliment Addie! A beauty Madeleine! CONGRATULATIONS! This image is now featured on the Homepage of the Group 'The Magic of Flowers'. 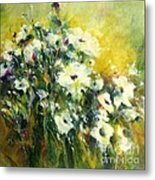 You are invited to visit the group and promote this image on the discussion thread "Flower Exhibit from Painterly Magicians". Of interest to everyone, please leave your thoughts about your creation in the group's discussion page: " Let us know about the SOUL of your work". Bravo for this marvelous art. Thanks so much Greta! I'm happy to be a part of this new group! Thank you all for your amazing comments and the features! Wow, so beautifully expressed! Love your spontaneous color palette, awesome work, Madeleine:)! My favorite painting of Female Artists - Creative Women today:)! Congratulations on Aug 22 2012! This wonderful image is featured on Homepage of All Glorious Gardens! Thanks for sharing with us at 3 A Day Greeting Cards for All Occasions. Your image has been featured and voted on. Thank you Madalena for your lovely comments and the feature. I love your paintings of Frida. 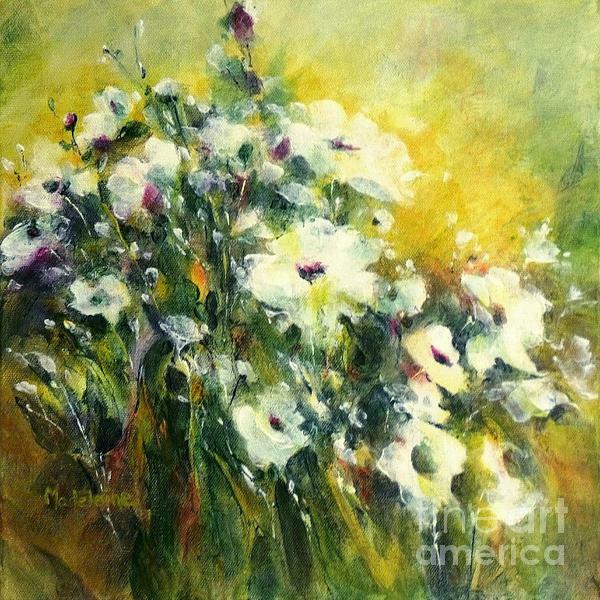 Another gorgeous flower painting, just love your expression in colors and brush strokes too. Thank you Xueling. Your portraits are wonderful. Madeleine, your work is beautiful! Love the composition and the feeling of movement in your work. Thank you Addie. Your photos are wonderful! Your art work just beautiful. I like this art with white poppies and another red poppies. Do you want to join to our group "I Like Poppies" with those and other poppies? Thank you Natalya. I have joined your group. 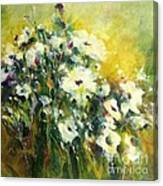 I love the white against the dark greens and bright yellows! Beautiful! Very fresh and springlike! Beautifully painted! Congratulations on being featured! 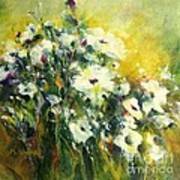 More white poppies, bursting with color and joy, in the 12" x 12" series, to use as a grouping or alone.